A Causative verb can include “have”, “get”, “make”, “let”, and “help”. John wakes up feeling a little groggy but a lot better. John has had his operation and he had his appendix removed. This morning he is going to have his breakfast brought to him in bed. He is having his room cleaned and they are going to make his bed. His wife Susan has come to see him. She has had her hair done yesterday. She has her hair done every month. She is going to have her fingernails done this afternoon. Hello John sorry I’m late but I had Janet on the phone. She has had her car stolen. The police are said to be studying the possibility that the car was used in a hold-up. The car is believed to be a write-off. That’s a shame and I must say I am felling one hundred times better already. They had the monthly audit done and everything is OK. They have had the computers checked. Janet and David are having their house decorated and we got invited to their wedding anniversary in September. Some chocolates were taken to John by Susan. he had his appendix removed. to have on the phone. one hundred times better already. A Causative verb may include “have”, “get”, “make”, “let”, and “help”. Did you have your bike stolen? No, I forgot where I left it, that’s all. Will you soon have your car running? Yes, hopefully it will be ready for the weekend. What time shall we set off? As soon as I get the car fixed. Did you get the man to deliver your shopping? I did get him to do it, thanks. I’d like that finished by nightfall, is that understood? It will be finished long before. Has Susan come to see you yet? Yes, she has just left. Nothing yet, it’s too early. What time are you having your hair done? At the usual time, around three o’clock. Three or four, it depends. Is the car a write off? No, it can be fixed. , and welcome.Today let’s look at a long vowel sound or , your lips are forward and very rounded in an oval shape, the front of your tongue must be down near the front of your mouth, so not too tense. Your bottom jaw is down: or, saw, orbit, bought, small autumn, caught, crawl. or, saw, orbit, bought, small autumn, caught, crawl. Now tests time, how would you pronounce these words? The answer is daughter, thought, wall.That’s it for today see you soon. 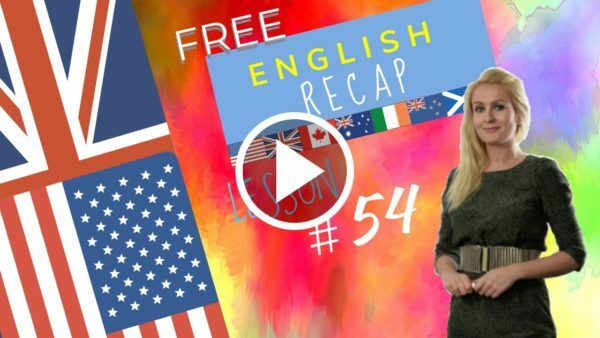 Lesson 54 recap with Julia.